And yes, maybe the cute packaging affecting my perception, but the product itself is just wonderful. Start with the color: it is a peachy pink shades that will look good in any skin tone. And you can use this blush in so many way, at the apple of your cheek, at you cheek bone, you name it!. This is absolutely not a type of blush/highlight product, because although it has a subtle shimmer on the pan, it wont transfer to the cheek so the result looks matte. Maybe because of that some of you wont like it, but I am perfectly fine with it. Talking about the amount of the product. The pan contains 8,5 gram of blush which considered standard BUT since it's very pigmented and a little goes a long way, I am sure it would last forever at least for me. When I will go out all day, this is the blush that I will reach for because the staying power is just amazing, I work from 9 to 6, and when I got home I can see the pinkish flush still on my cheek, something that I rarely seen with other blush. Back to the packaging. Let me start by saying, the packaging is so adorable! 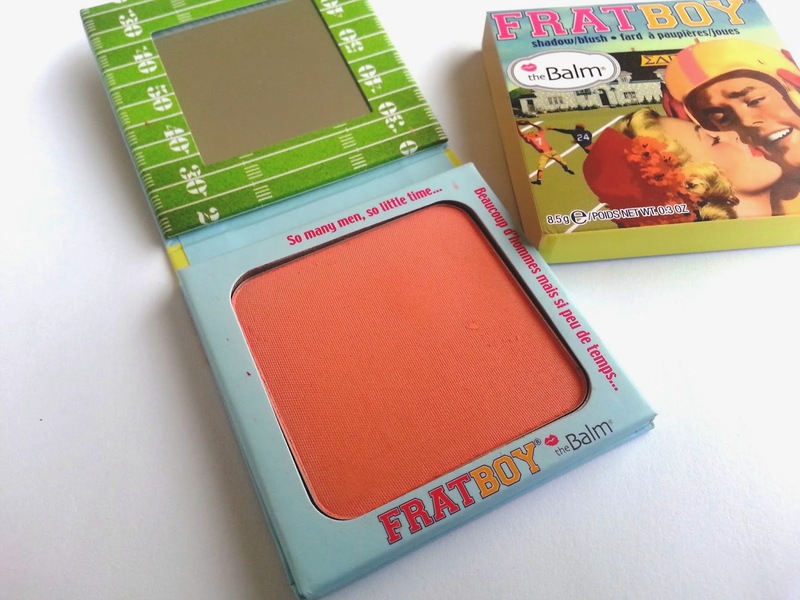 If I could fall in love with a packaging of a beauty product, then I would fall for Frat Boy from The Balm. It comes in a cardboard packaging with a mirror inside - which always a plus. It's not bulky at all so perfect for travelling. The color stays true, it looks peachy on the swatch, so it looks peachy on my cheek as well. An yes, yes, you only need a little with this product, but you can absolutely build it up and you'll stay pretty, but of course at some point when you go crazy with it, you will look like a crazy too :D. The texture is soft and there's not fall out whatsoever. Sigh...it's just heaven. Anyway, enough with my ramble, I just love love love this blush! It is expensive though, but hey, you can always get a discount on Haute Look because that's where I got mine. Have you tried this? Let me know what you think at the comment bellow. Have a nice day! You'll love it! :)) and I just follow you back on bloglovin !